David Ferguson Pianist singer is a top class entertainer. 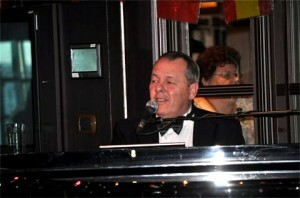 David Ferguson Pianist Singer is a top class entertainer with a huge repertoire of music for weddings and special events . Popular and in demand David has a long and varied repertoire ranging from jazz standards to modern day chart hits, all played in a very unique and stylish way. His ability to capture the mood of any occasion whether it be a moment of sensitivity or a full on sing-along might explain why David is in such demand ! David is an Australian based in Edinburgh Scotland and travels the country with his piano/Keyboard playing in hotels, restaurants, bars and clubs. Over the years he has worked extensively for top companies and cruise liners including several contracts for Cunard entertaining passengers on the Queen Elizabeth and the Queen Victoria. For special events and tribute nights Dave performs ‘An evening with New York Piano Players’ a man and a piano remembering the great pianists of New York featuring artists like Barry Manilow, Neil Sedaka, Michael Feinstein, Tom Lehrer and of course the great Billy Joel. Fully self-contained with a high quality piano/Keyboard and top quality PA sound to suit every size of venue.